Bop bop bop to the top of your day as you enjoy the music of the High School Musical Pep Rally on the D-COT Jukebox! In early 2006, the Disney Company realized they struck a chord when they released the Disney Channel Original Movie, High School Musical and the young audiences raved! 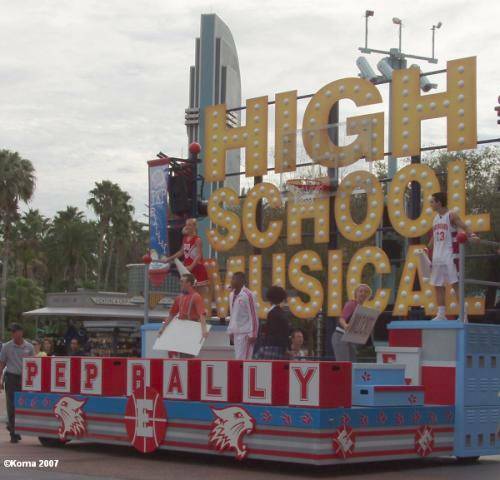 Later that year they decided to keep the groove going with the release of the High School Musical Pep Rally in their theme parks, including at Disney’s Hollywood Studios. It didn’t bop bop stop there! Disney produced 2 sequels and a spin-off to the hit movie and the Pep Rally evolved too. D-COT found what we’d been looking for in this musical show and added it to the Jukebox on March 4, 2009. The Pep Rally recently passed into Disney theme park history, but the soundtrack still lives on with all of us. We’re all in this together with our enjoyment of this show and especially this particular track. Bopping to the top six times just wasn’t good enough for some of us, so we needed to do it a seventh time! You would think that by then we’d be sick of it, but the track still has a play count of 1,049 with a weekly count of 1 (that was probably me so I could get the stats). A record 2 Members have it as a Favorite and 1 Supporter has it on a Custom Playlist. The track gets a high score of 2.0/5 stars average with 15 votes. With stats like these, this track can be found on your Random 25 Playlist! While the Pep Rally is no longer at the theme parks and the movies have come and gone, don’t make the mistake of thinking Disney isn’t sticking to the status quo. A new Disney online video streaming service called Disney+ is coming and a High School Musical series is slated to be a part of that! That’s no April Fool’s joke. So for all you die-hard Wildcats fans, getcha head in the game when Disney+ comes out because you still have plenty to look forward to! Quiz: Test your knowledge of MGM / Hollywood Studios! @grumpytude I was sooo tempted to say it was on @sej101 ‘s playlist!